The Government of Canada is providing up to $10.2 million in funding for the second phase of the Sherman Campus project in Toronto, which will bring a new recreational and community programming facility to residents of one of the city’s most vibrant districts. 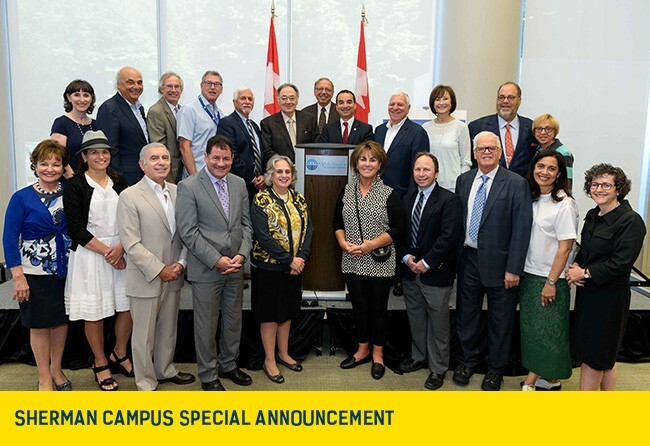 Michael Levitt, Member of Parliament for York Centre, on behalf of the Honourable Amarjeet Sohi, Minister of Infrastructure and Communities, and Morris Perlis, Board Chair of the United Jewish Appeal Federation (UJA), made the announcement today at the Sherman Campus in North York. James Pasternak, City Councillor for York Centre, was also in attendance. The new complex is part of a broader initiative to expand and renew UJA’s community facilities across the Greater Toronto Area. It will be equipped with fitness facilities, meeting rooms, seminar areas and teaching spaces. Other features of the project include indoor and outdoor aquatic centres, outdoor sports courts, and nature and fitness trails. Once complete, this project will help meet the increasing needs of one of Toronto's fastest growing communities by offering a range of programs covering health and wellness, arts and culture, early childhood education and much more. Federal funding for Phase 2 of the Sherman Campus is being provided through the Major Infrastructure Component of the Building Canada Fund and represents approximately 15% of the total project costs. The Sherman Campus Campaign has had tremendous success since the UJA Board of Directors gave approval to proceed with the plans for Phase 2 in March of 2015. Including the funding from the Government of Canada, over $40 million has been raised under the leadership of Fred Waks and the Sherman Campus Leadership Committee, with just under $10 million to go to complete the fundraising necessary for the project. The Government of Canada funding is contingent on 100% of the fundraising being finalized by UJA Federation’s Tomorrow Campaign over the next few months. Formal application for Site Plan Approval has been made to the City of Toronto and UJA is planning to begin construction on Sherman Campus Phase 2 in the Fall of 2017 with an expected construction completion date of late 2019. Watch a recording of the announcement here.